Hi everyone... or shall I say Meow!? 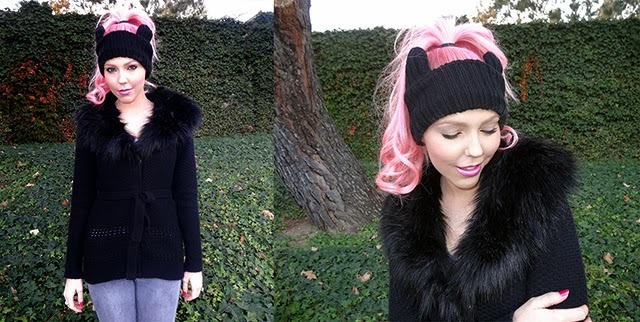 It has been really chilly lately so I decided to brave the cold with some faux fur and kitty ears. This outfit has the two main characteristics that I look for in a typical Fall/Winter outfit. It is most importantly warm and second it is totally comfortable! I love dressing up but some days, especially cold days, I just want to be casual and cozy. My overall look is relaxed and rather monochrome but I decided to add a bold pop of color with a bright turquoise handbag which I thought complemented my pink hair well. I got my cat eared beanie headband from Hot Topic over the weekend for $12.99. It is super warm and I thought it would be adorable on the slopes this season! My grey skinny jeans are from Hot Topic as well. You should check out their denim section if you haven't already. I'm always pleasantly surprised by their great selection and even better prices. My black knitted jacket with faux fur collar is from Guess. The collar is removable which adds versatility and makes washing a whole lot easier. Completing my warm winter outfit are my black Mongolian fur Ugg boots. Here kitty, kitty.